Everyone knows that fragile, valuable, delicate, and sensitive items require proper packaging for shipment. However, if you do want your precious possessions to arrive at their destination in perfect condition, let’s not forget about one more important step of the safe and secure transportation process. We are now talking about custom crating, which is crucial for shipping freight of exceptional value, including art and antiques of any kind. This is where wooden crates manufacturers come into play! It’s not a secret that at Fine Art Shippers, we ship fine art and antiques both across the United States and internationally. However, we would not be professionals if we did not provide a high-quality packing and crating service. 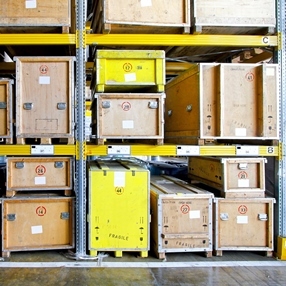 As one of the most reliable freight companies in NYC, we know how custom crating is important for the successful transportation of valuables and collectibles. Moreover, this applies not only to fragile paintings, porcelain, and various figurines. Shipping awkward, heavy, and oversized items also requires custom crating with attention to detail. Thereby, at Fine Art Shippers, we offer comprehensive packing and crating services in-house, which has eventually made us one of the best wooden crates manufacturers in NYC. cardboard crating, custom packaging, and more. Overall, whether it comes to moving a collection of paintings across the country or shipping a large bronze sculpture overseas, Fine Art Shippers can provide you with the best crating service ever! Furthermore, we will do it for you at a reasonable price, meaning that you are guaranteed to stay within your budget. So if you are looking for professional wooden crates manufacturers in NYC, look no further! You are already where you need to be!